Who is Debbie "Takara" Shelor? Hi. My name is Takara and I'm the web designer and author for most of the site. I once lived a rather "normal" life - if there really is such a thing. I was an Industrial Engineer. I lived the life that most would envy - full of luxury and travel. Even with all the "stuff," I wasn't really happy. Then one day my world just fell apart. You might have gone through a similar experience - a time when you lost something you really cared about - like your job, your spouse or mate, your home, your health, your money, or something else. I lovingly refer to that time as the "metaphysical 2 by 4 up side the head." It's a cosmic pause in the game called life when you get to evaluate your life and discover what really matters to you. And you get to decide if you want something to change. I decided I wanted EVERYTHING to change. So I began an intense journey of personal growth and spiritual transformation. And that's when the dolphins showed up. They have been "appearing" in my meditations for over 18 years now. And they have taught me, and helped me design, all sorts of powerful tools for health and healing. I eventually left the corporate world, moved to the west coast of the United States. I'm now happier, healthier, and living the life I choose. Now you can use the same tools and wisdom that I've applied in my life to make improvements and quantum leaps in yours. There are many tools to choose from as you will see as you click around our website. Everything from flower essences infused with dolphin healing vibrations to self help books containing totally new and powerfully effective healing technologies. My ultimate joy is writing, so there is always another book underway. If a person had a health issue, a marital problem, a burning question, a disagreement with someone, or some other issue they didn't know how to resolve, they sought the advice of the Wise Woman or Man of the village. (They were called different things by different cultures). These people typically had some form of intuitive or psychic ability, were highly connected to the natural world, and were skilled in the healing arts. They knew a great deal about people, what motivates them, what causes them to experience fear, anger, sadness, and joy, and how to teach people better ways to communicate and forgive in order to improve situations and relationships. They knew that healing required looking at the person as a whole - their life, their choices, their emotions, their environment, and that true healing required change on more than just the physical level. They offered beneficial insight, advice and instruction that assisted the person in resolving whatever was of concern. They offered a new perspective about the people and situations being discussed. They suggested diet, exercise, & other lifestyle changes. They helped the person make positive improvements in their life. They sometimes did a ceremony with them or for them. They helped a person discover and enhance their own natural gifts and talents. They helped them become happier, healthier, and more whole. - Paracelsus (1493 - 1541) - Swiss physician known as the "Father of Modern Medicine"
Only now the "village" is global and we connect through the internet. I've "known" things my entire life. I guess I began noticing that about myself when I was about five years old. I could just look at someone and "know" that something wasn't quite right emotionally. I'd lean over and quietly ask if they were O. K. Usually they would react with a shocked look on their face - since no-one else had been able to tell that something was wrong. I can sometimes also tell if there is a serious health issue - even before it manifests into physical symptoms. Most people feel extremely safe sharing information with me. Even when I was an Industrial Engineer working in the pharmaceutical industry. Various employees and co-workers would pull me aside, or come into my office and close the door, in order to pour their hearts out over something going on in their life that they had absolutely no one else to talk to about it. And they typically walked away feeling significantly better then they did when the conversation began. At the age of 33, I had a complete stress-induced melt down. I went through the pits of despair and rose again from the ashes just like the Phoenix - entirely reborn as a completely new individual. My life has never been the same since. Instead of continuing to run away, like so many of us do, from who I really am and what I truly desire, I began to embrace those things. I discovered and remembered past lives and hidden talents. I began to grow personally and spiritually. I learned to follow my intuition and inner guidance system as it took me on quite a remarkable journey of healing and discovery - my personal quest for Magnificence. Dolphins started appearing in my meditations and began sending me powerful healing energies. Now, more than 15 years later, I teach others what I have learned. I can share from my own experience and the experience of thousands of others I have assisted in becoming whole, happy, and free of limitations. Much of what I offer comes straight from the Divine Presence (the Supreme Being, by whatever name). The energies I work with, the insights I offer, the books I write, and the products I share are all profoundly transformational. I have many friends and collegues that are also wise women and men. They are knowledgeable in numerous areas. So if I don't have an answer for something, I can often recommend someone who does. Takara holds a Bachelor of Science degree in Industrial Engineering from one of the top five engineering schools in the United States. In the corporate world she specialized in personal and team development with an emphasis in communication. She was also a corporate trainer for team development and statistical quality control. She has held front line supervisory, industrial engineering, and management positions in Fortune 500 companies in the pharmaceutical industry. She has an extensive background in human factors (how humans relate best to their environment) and ergonomics (how to best create an environment suitable for a human). Debbie a.k.a. Takara is an internationally known author and speaker. Many of her articles have been published in national/regional newsletters and magazines as well we online. In addition, she has self-published several books and booklets. She has taught workshops on many topics in the U.S. and internationally. Several thousand people worldwide read her monthly email newsletter - Here's to Your Magnificence(TM). Dolphins are one of Takara's greatest loves. In 1996 she left the corporate world to move to the San Juan Islands of Washington State. This allowed her time to be near and study the Orca and to co-found a non-profit for dolphins and whales. She provides private clients with tools and techniques for person growth and empowerment; physical, mental, emotional, and spiritual healing; and motivation. 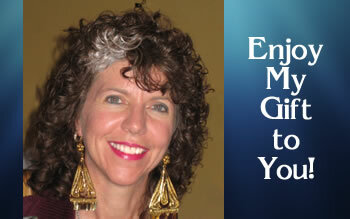 She works extensively with vibrational and energy healing technologies. She is very compassionate, intuitive, and understanding. She has the ability to completely (empathetically) put herself in someone elses shoes. This assists her in having extraordinary clarity and insight about the issues a person is facing. Beginning with her pharmaceutical career, and quickly transitioning to alternative and then finally vibrational medicine, she has spent many years researching and teaching about healing products and technologies. Combining her background in engineering, design, communication and personal development with her interest in dolphins and healing technologies, she has developed several products and processes for personal growth and empowerment. She offers private sessions and leads transformation workshops on land and at sea. "How do you thank someone who comes into your life and because of her influence your life is changed forever? Takara has graced my life with her many talents and skills. Especially through her healing arts, I have made quantum leaps forward in my life. At one crisis point she was able to facilitate my integration of a significant shift in only 10 minutes! I had been beside myself for 2 weeks. Her knowledge and keen ability to share it have enriched my life forever! Perhaps due to her engineering and teaching background she has an amazing ability to take extremely complex concepts and information and boil it down to bottom line usefulness with clarity. She makes things implicitly simple and understandable to a lay person. Her extensive studies in metaphysical and philosophical areas allow her to create freeways for those of us who don't have time to sift it all out. The clarity she creates with her accelerated techniques allows you to quickly come on-line with the information (provided you are ready to run with it), to transition, and to push past limitations." 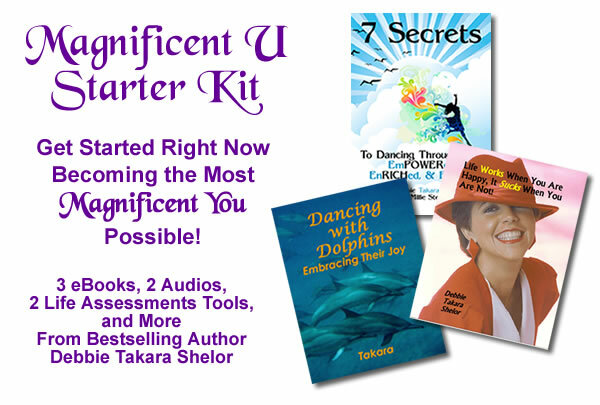 Visit Takara's other websites: Dolphin Empowerment and Dancing Dolphin Essences & Aromatherapy Roll-Ons. Return from Who is Debbie "Takara" Shelor to the Spirit of Nature Spirituality home page.